Being homeschooled keeps life interesting and spending so much time as a family provides the opportunity to make lots of memories. Now multiply that times 8 or 12 kids. 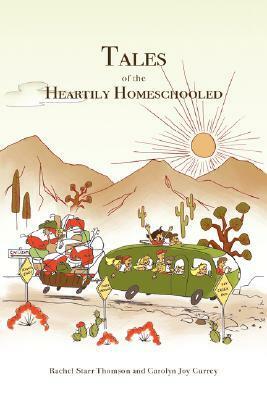 In this book, Carolyn Currey and Rachel Starr Thomson, oldest children in large homeschooling families, share the hilarious situations their clans have encountered. From a tipping Christmas tree, to exploding vacuum cleaners, to elf eating hobbits, life in the Currey and Thomson households is never dull. I purchased this book as a gift for a friend and wasn’t quite sure what to expect. I knew Rachel’s writing from her Seventh World Trilogy, but this kind of book is a completely different concept. It was the little preview I got on my kindle that sold me. I read the stories out loud to my family and we laughed through them. The rest of the book did not disappoint. Every story was well written and almost all of them were laugh-out-loud funny as well as relatable (even if, like me, you’re not part of a large family). I highly recommend this book to read yourself, and to give as a gift (my friend loved it too ;)). this sure sounds like a delightful family read! Thanks for the review, Leah!